Why I Chose It: Michigan Quarterly Review Reader Michael M. Weinstein introduces Sohrab Sepehri’s poem “Toward the Image of the Friend,” Translated by Franklin Lewis, from our Spring 2019 Issue: Iran. The poems of Sohrab Sepehri (1928-1980) occupy a special place in the history of Persian poetry, and in the current issue of MQR, which aims to give voice to a wide range of Iranian perspectives—canonical and contemporary, local and diasporic. Sohrab, a poet so iconic that he is often referred to in Iran by his first name alone, was also a painter; a world traveler; a lifelong bachelor; a mystic; and an acolyte of both Buddhist and Islamic thought. He was, by all accounts, mysterious and solipsistic: a visionary who eschewed worldly concerns but refused to abandon the realities of nature. And while many prominent poets of his generation, including Reżā Barāheni and Ahmad Shamlou, derided Sohrab’s work as insufficiently political, his work is now celebrated as one of the most lasting contributions to Iranian literature of the past century. The cornerstone of Sohrab’s credo was attentiveness to the natural world. The title of one of his most famous collections, Mā hič, mā negāh (1977), roughly translates to We Are Nothing but the Gaze. His faith in the poet’s capacity to perceive the beauty of God by means of nature aligns him with Anglophone poets like Gerard Manley Hopkins, while his mystical intensity might call to mind the work of European modernists like Rainer Maria Rilke or Boris Pasternak. Like all of these figures, Sohrab was one of the first poets in his own cultural context to break away from the formal verse structures of his forebears (such as the ghazaland and the matnawi of Classical Persian poetry) and write free verse. His formal innovation, spiritual world-view, and keenly observant, painterly eye are all on display in “Toward the Image of the Friend,” beautifully translated by Franklin Lewis. Our contemporary political climate and rhetoric surrounding Iran could not be further from the peaceful and deeply attentive ethos of Sohrab’s work. But perhaps this supposedly “apolitical” poet offers a corrective to the facile, flawed generalizations we might tend to make about cultures like his. The true nature of any locale, he seems to suggest, is at once more absolute and more nuanced than any words can capture. His poetry stands as a reminder of Iran’s rich and cosmopolitan literary past, even as its blend of mysticism and clarity, lyricism and earthiness, continues to resonate beyond the borders of time and place. Purchase MQR 57:6 or consider a one-year subscription to read more. 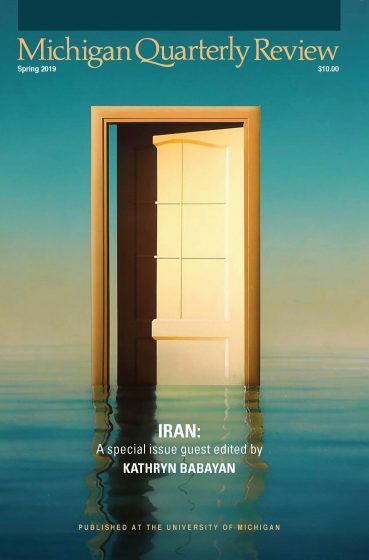 Sohrab Sepehri’s poem “Toward the Image of the Friend” appears in the Spring 2019 Issue of MQR on Iran. SOHRAB SEPEHRI (1928–1980) was among Iran’s foremost modernist writers. A painter as well as a poet, a student of Buddhist as well as Islamic thought, he perfected a lean but playful style where he merged world with word, the leaves of his childhood landscape with the leaves of his book.